At Main Street Roasters, We roast only the highest quality of Arabica beans, and pride ourselves in providing a fresh product. We roast every pound in-house. Our coffee is desired by many due to its smooth and bold qualities, our standard for freshness, and also for our large variety of choices available at reasonable prices. Sit down under the hand-hewn timbers of the Restaurant Barn and enjoy Amish Acres nationally famous Threshers Dinner, a family style feast of Amish country favorites. In tribute to the generations of Amish threshers who band together each harvest season to cut and thresh, thus separating the grain from the chaff, each other’s crops in friendship, mutual aid and neighborliness. The 100,000 s.f. renovated factory now houses a variety of specialty shops offering locally-made, handcrafted and freshly-baked items. Get a glimpse into the history of the Coppes Kitchens, once ordered by Frank Sinatra, Elvis Presley and President John F. Kennedy, while visiting the cabinet museum and shopping this rustic and rambling brick building. Watch creative ice-cream treats come to life using liquid nitrogen, taste and buy fresh baked goods, cheeses, and bulk foods, search for treasure in our antique mall or find your next great read in the bookstore. That’s just a sample of what’s in store at Coppes Commons! Hunters Hideaway is a locally owned neighborhood bar and grill that takes pride in the service and experience of our guest. We have a menu that includes everyone’s favorites, from burgers, to pizzas, to nachos! And even though we’re family friendly, we make some of the best craft cocktails around! We also have 23 TV's if you are looking to catch your favorite team’s game. If you are looking for a place with great food and service, just take a seat at our bar, our family dining room, or our heated patio, and we’ll be happy to serve you! Local bakery located downtown Nappanee. 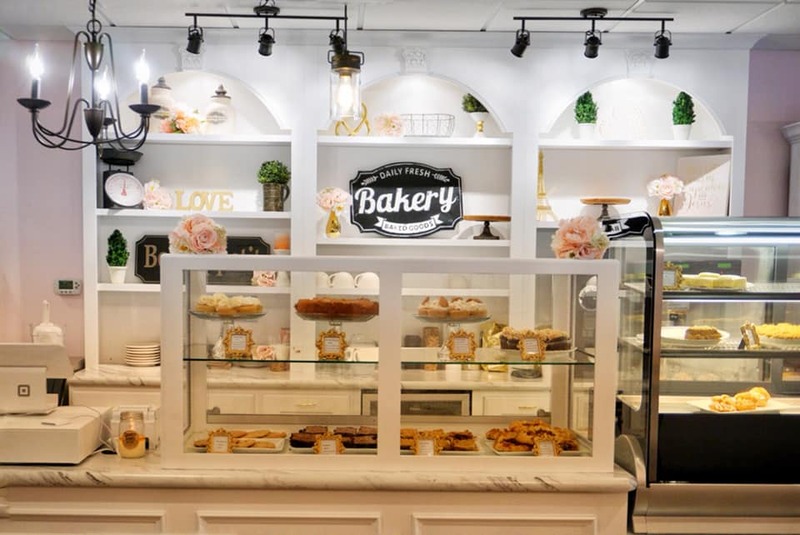 Jodi Hochstetler said she wanted to “bring a little bit of Paris to Nappanee” with her delectable French pastries, and we are so happy that she did! The Pretty Cakery also specializes in custom cakes for weddings, birthdays, or any celebration.